PROSTHETIC RECORDS are pleased to announce the signing of Illinois-based symphonic melodeath group STARKILL to their evergrowing roster. 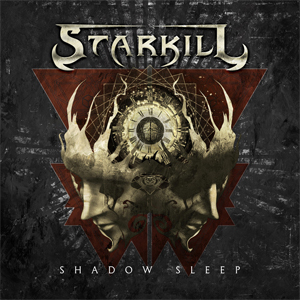 Formed in 2008, STARKILL self-released their debut EP before being discovered by Century Media Records in 2011 where they went on to release two full-length albums, 2013's Fires Of Life and its follow-up Virus Of The Mind in 2014. STARKILL are excited to reveal their third album, Shadow Sleep, will be released via Prosthetic Records worldwide on November 4, 2016. Lead guitarist and vocalist, PARKER JAMESON commented, “We are thrilled to announce not only our signing to new home Prosthetic Records, but also the release of our third studio album, Shadow Sleep. JAMESON continued to reveal, "Gustavo Sazes [ARCH ENEMY, KAMELOT, FIREWIND] tackled the artwork which perfectly matches the themes of internal struggle and introspective lyrics, and this was the first album in which the four of us tackled a good amount of the actual tracking and production of the album.” Take a peak at the album's cover artwork below! Recorded and mixed at Electrowerks Studio with Chuck Macak (FALL OF TROY, OCEANO, LETLIVE) while being sent for mastering by Troy Glessner (AUGUST BURNS RED, DEVIN TOWNSEND, DEATH CAB FOR CUTIE), Shadow Sleep presents 13 tracks of melodic, majestic death metal reinforced by JAMESON's over-the-top shredding paired with one of the tightest rhythm sections in the scene. STARKILL have created a brief video announcing their new signing while teasing audio clips taken from Shadow Sleep which can be seen streaming below.